James Washington Patton had a flirty sister-in-law from Charleston named Charlotte Kerry, who encouraged gentleman callers to take her for strolls up the ridge to the east of downtown Asheville. Patton teasingly began calling the mountain “Charlotte’s beau catcher.” The name stuck. Beaucatcher Mountain rises in North Asheville behind the old Manor Inn grounds. Within a few hundred yards it reaches its 2,694-foot summit – about five hundred feet above town level – and then it parallels Charlotte Street for about a mile, bisected by the deep notch of the I-240 open cut (1980) and Beaucatcher Tunnel (1927). Finally the west side slopes downward and peters out with a kink above the city’s abandoned White Fawn Reservoir. The east side looms above Haw Creek and Tunnel Road, tailing off in Kenilworth. In the summer Beaucatcher presents as a long green shoulder; in winter, the loss of its leafy canopy reveals that it is spider-webbed with narrow, twisty roads serving a liberal scattering of houses. The homes are older and modest on the lower slopes, but they increase in size and value in direct proportion to altitude. In 1921 a group of local movers and shakers began exploring ways to sell Asheville’s scenery. 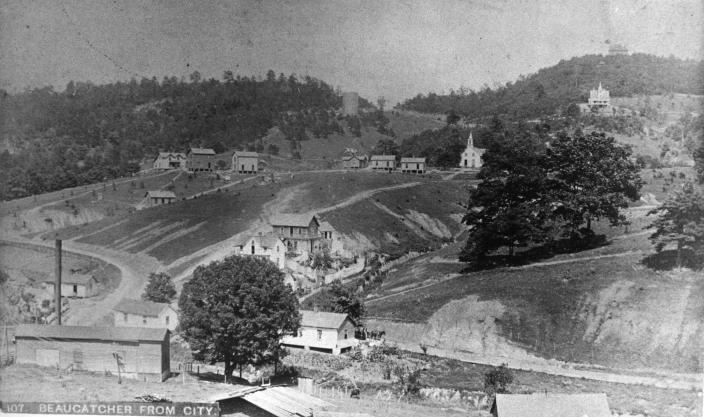 The town hired noted city planner John Nolen, famous for his work in Boston and Florida, to produce what amounted to Asheville’s very first “city plan,” which included a proposed overlook park that would run in a quarter circle around town from Beaucatcher all the way to what became the site of Asheville High. 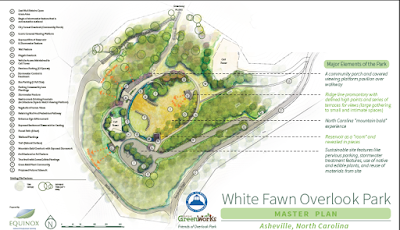 Nolen’s vision, promulgated when Asheville’s population and area were one-third of what they are today, has been seized on as a sort of manifest-destiny mantra by the present city government and community greenway proponents. 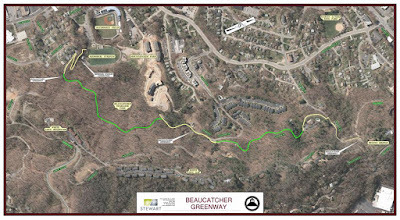 The proposed Beaucatcher Greenway is supposed to be the jewel in the crown of Asheville’s “River to Ridge” greenway network. Its footprint runs from Helen’s Bridge in the north down and across the spine of the mountain to White Fawn -- above McCormick Field and Memorial Stadium – and, proponents say, affording excellent biking and hiking, as well as spectacular views of downtown. But it’s also the only greenway in that network that would run through several long-established neighborhoods. 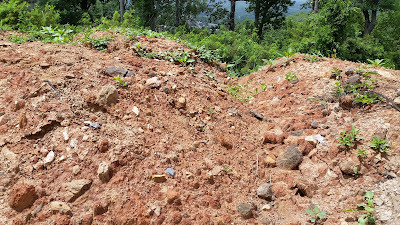 It also cuts smack across what has been called the last wild woodland within the city limits, – travelling across the steep slope of a mountain whose unsteady, shaly rock foundation and thin, runoff-prone soil have been problematic from day one. 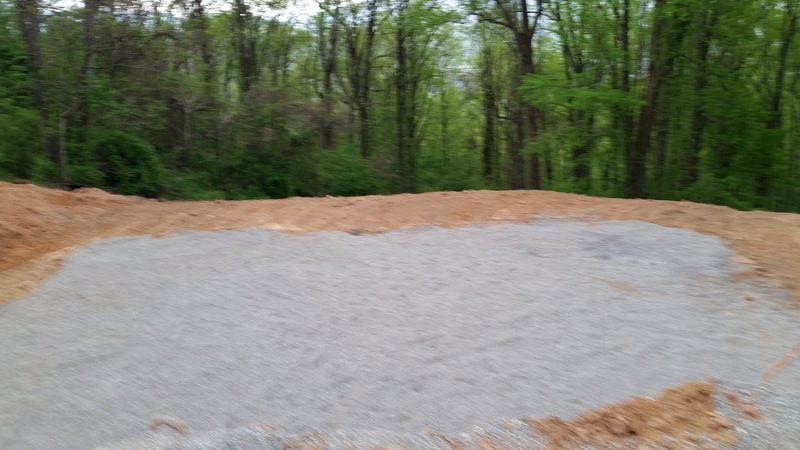 One resident called the plan, with its 1.2 miles of ten-foot-wide asphalt trails and its 14-foot retaining walls “an act of vandalism.” Others have produced documents showing that the city has fiddled the numbers of old-growth trees that are to be removed. All in all, critics say, the Beaucatcher plan is another example of city government’s reckless disregard for the consequences of pushing through a pet project. Nearby residents complain that the greenway’s path threatens not only their privacy but their property itself. Among those affected are the residents of Sky Club Condominiums, the three-story mansion that was first a private home and later a popular restaurant and inn. The greenway parallels and partly overlaps Ardmion Road, which the Sky Club uses as a private, gated driveway but which the city claims has a public right-of-way. "The Sky Club is not your park," Nancy Brown, president of the Sky Club homeowners association, told the city last year. "The Sky Club is a historic building for this city, and its look will be diminished by adding a walkway in front of it." Subsequent tweaks to the design reduced the city’s encroachment on Ardmion from 27 feet to 14, but the residents are still contemplating legal action. Their attorney is Albert Sneed, who is a member of the same law firm as Mayor Esther Manheimer, who has recused herself from the Sky Club discussions. Then there’s the cost. 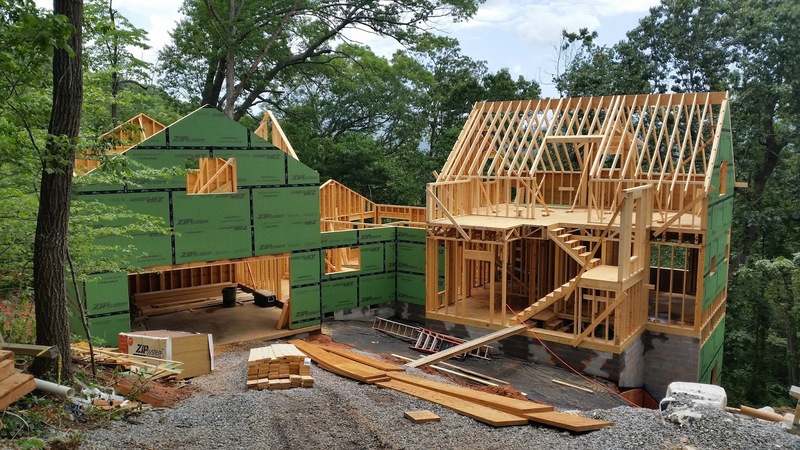 Last year Iona Thomas of Stewart Engineering, designers of the greenway project, said rapidly rising construction costs could eventually exceed $4 million, far in excess of the $1.5 million-per-mile figure often cited as the average price of greenway development. Present estimated cost of the project, however, is $4.7 million, more than triple the benchmark figure. Last October the Tourism Development Authority approved a $1.7 million grant to be split between the French Broad and Beaucatcher greenways; the city will have to make up the difference from its general fund but is said to be seeking unspecified federal funding for up to 80 per cent of the difference. The city let bids for the project in March. Meanwhile, a local group has big plans for that old, abandoned reservoir. The Friends of Beaucatcher Overlook Park is a nonprofit dedicated to fulfilling the vision of the late Steve Jones, who lived on nearby Town Mountain but had a consuming interest in establishing a park on the White Pine site. Jones bequeathed $25,000 towards the pursuit of that goal. 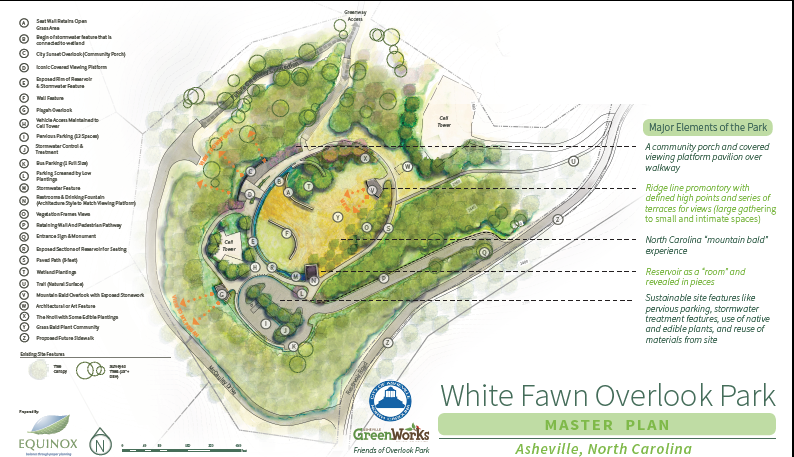 Accordingly the Friends recently commissioned Equinox Environmental of Asheville to design a master plan that would use the bones of the old reservoir as the foundation for a mountainside park. The president of Equinox is David Tuch, husband of City of Asheville Planning Director Shannon Tuch. Balds – grassy expanses devoid of trees and shrubs – are natural phenomena found only on the summits of certain mountains; nearby ones include Max Patch and Big Bald, both in Madison County. Balds’ bareness allows for spectacular 360-degree views. 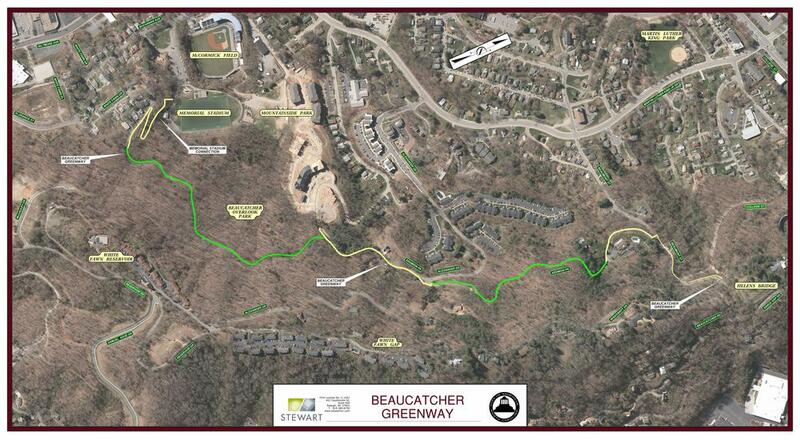 It is not clear how Equinox plans to achieve this effect from halfway up a hill, but drawings indicate an open space that will contain a “grass bald plant community.” A paved path would connect all this to Beaucatcher Greenway. Total cost of the project is put at $3 million. FOBO is seeking funding. The current view from the top of Beaucatcher, looking west. 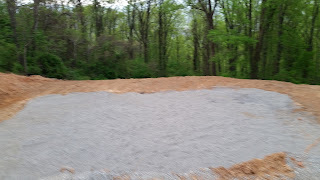 Hence the southern top of Beaucatcher is presently an expanse of raw red earth and scattered gravel, inhabited by trucks and bulldozers. Further down are large homes in various stages of construction. Conservationists and nearby residents view the situation with alarm but say the developer is home free thanks to a significant loophole in city planning and zoning regulations: Beaucatcher Heights homes are single family dwellings, and that designation makes the project exempt from city council approval. That fact has frustrated and angered a number of residents in Kenilworth, the historic old neighborhood at the eastern foot of Beaucatcher, since activity first began on the development site in 2007. The concerns there now, as then, are stormwater runoff and neighborhood disruption. The development’s boundaries also threatened those of the South Asheville Cemetery, the city’s historic black community burying ground which was founded in the 1840’s. Early on, the Beaucatcher Heights construction crew installed silt fencing along the recorded boundaries of the cemetery, but local historians and black community leaders maintained – and still do – that in addition to the more than 2,000 graves accounted for, more are likely to be found within what is now the Beaucatcher Heights property. 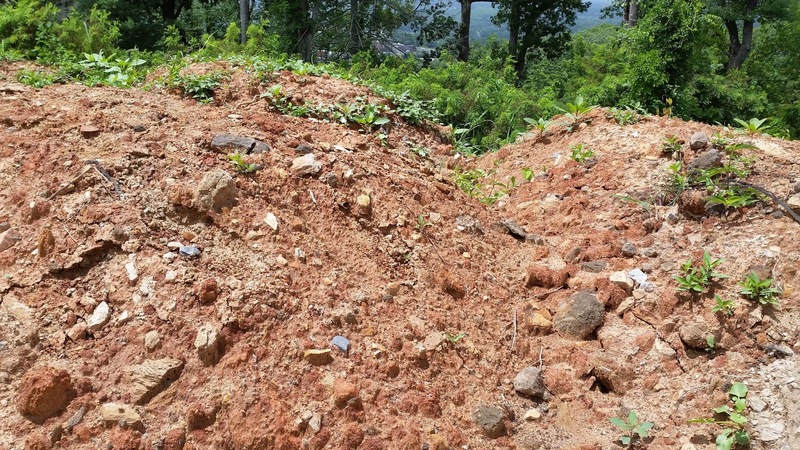 Proof is elusive, scholars and townspeople say, because some of those interred were probably slaves, their graves marked only with makeshift materials, or not at all. A recent check showed eight homesites currently available in Beaucatcher Heights, with a price range of $129,000 to $449,000. “Whoever said, ‘You can’t eat view’ never sold real estate in Asheville,” a local wag said.